Ascorbic acid (the L-enantiomer commonly known as vitamin C) is an important antioxidant found in living organisms and applied as additives in food and other industrial processes. By reacting with reactive oxygen species, it protects the cell from oxidative damages. BioAssay Systems’ method provides a simple, direct and high-throughput assay for measuring ascorbic acid. 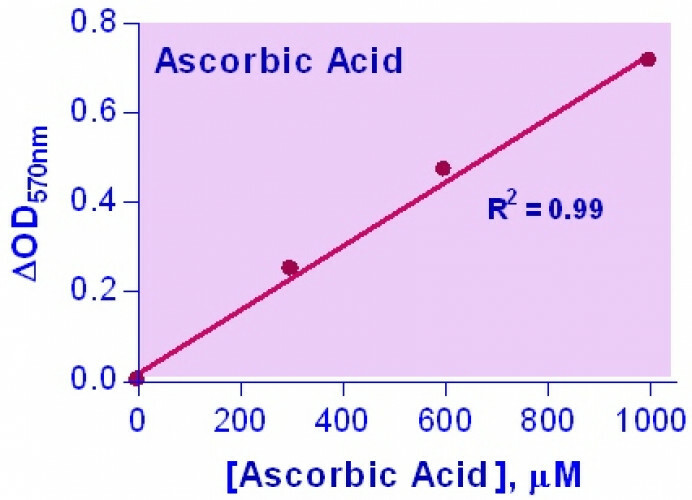 In this assay, ascorbic acid is oxidized by ascorbate oxidase resulting in the production of H2O2 which reacts with a specific dye to form a pink colored product. 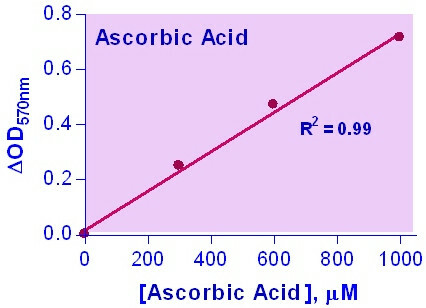 The color intensity at 570nm or fluorescence intensity (530/585 nm) is directly proportional to the ascorbic acid concentration in the sample. Applications For quantitative determination of ascorbate (ascorbic acid) and evaluation of drug effects on ascorbic acid metabolism. References Assay: Plasma in Humans (Pubmed).